Farming the sea offers huge opportunities to feed the world, and reduce poverty. The Philippines is committed to maximising its potential in this new industry. By Henrylito D. Tacio. Manila, September 4, 2018. In 2008, the Philippines ranked sixth in global fish and aquaculture production. Twenty-three years earlier, in 1985, the country was listed number four. And after China, the Philippines was the second largest seaweed producer in the world. Marine farming is seeing a rapid increase in Filipino waters. Courtesy H.D.Tacio. “These figures suggest we are rich in fisheries and coastal resources as a nation, and yet, hunger affected 4.5 million families in the last quarter of 2011,” said Senator Loren Legarda, a long-time a Filipino environmentalist, journalist, and politician, and a strong proponent of developing the fishing industry in SE Asia. “This alarming irony becomes even more glaring given the fact that while we are rich in fisheries and coastal resources, among the poorest in our country are coastal communities with 4 of 10 coastal residents living under poverty line,” she added. Activists like Senator Legards say there is no better way than to develop the country’s coastal and oceanic aquaculture potential for food security and livelihood generation. A recent paper presented during the 40th Annual Scientific Meeting of the National Academy of Science and Technology (NAST) seems to back them up. Fish provide some the majority of Filipinos with their regular protein intakes. Courtesy H.D.Tacio. Aquaculture, unlike open water fishing, relies on semi-captive farming of fish, crustaceans, molluscs, aquatic plants, algae and other marine organisms. And it is booming already; figures indicate it is growing at an average rate of 8.8% annually, and is expected to overtake capture fisheries production by 2020. One of the most efficient ways to produce more fish is to raise them just like livestock. In the Philippines, the concept of mariculture park – similar to an industrial or science park on land – came into existence in 2001. That year the first mariculture park was introduced by the Bureau of Fisheries and Aquatic Resources (BFAR) in the waters off the Island Garden City of Samal, Davao Province. 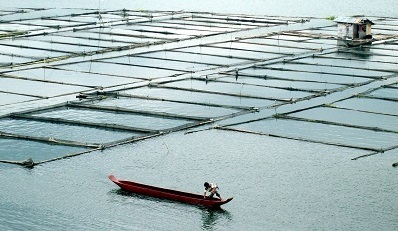 The first floating cages there were used for milkfish culture. In the last 17 years, this toe in the water has expanded dramatically, with some 4,320 million metric tons of fishery and other marine products produced across Filipino coastal waters in 2017. And of that, almost 52% came from aquaculture, with the remaining 48% from capture fisheries, both inland and deep sea. Major aquaculture products include seaweeds (62.5%), milk fish or “bangus” (18.6%), tilapia (11.9%), tiger prawn (2%), oyster (1%) and mussel (0.08%). The bounty becoming available from the waters of SE Asia is having an effect. “Fish is the primary source of protein of animal protein in the diet of many Filipinos [now] with per capita fish consumption of 34.1 kilograms,” said Guerrero, who is also former director of the Philippine Council for Aquatic and Marine Research and Development. Like most of SE Asia, the Philippines is well-equipped to benefit from a boost in aquaculture. It is an archipelago with more than 7,000 islands and some 18,500 kilometers of coastline. It also boasts 26.6 million hectares of coastal (inshore) waters, and 193.4 million hectares of oceanic (offshore) waters. However, due to more intensive farming practices on land, the cost of fishery products has not kept in line with other popular foods. Sea fishing is taking a heavy toll on some species of fish - such as tuna. Courtesy H.D.Tacio. “Fish, which used to be among the cheapest sources of protein, is now more expensive than pork or chicken,” said Senator Legarda, who is pushing for the creation of a specialist department for Fisheries. “The [government] is being called upon to perform its task to ensure sufficient food supply to millions of Filipinos through the development of the vast Philippine fisheries potential,” she said. But any new initiatives need to take into account the potential for – if not killing, then severely depleting – the goose that lays the golden eggs. As Anne Platt McGinn, a researcher at the Worldwatch Institute notes, “… the ultimate success of aquaculture may lie in the ability of its developers to leapfrog the mistakes of agriculture – to resist putting chemicals in the water and hormones in fry, and consuming vast quantities of resources to get their products out,” she adds. Small-time fishermen are a dying breed as farms become more common. Courtesy H.D.Tacio. First steps look promising. Not far from Samal is the Panabo City Mariculture Park (PCMP), which was established in 2006 with partnership of the city government and the Philippines Department of Agriculture. According to Guerrero, the city government unit provides local governance and regulations while BFAR provides technical and advisory services. And to maintain sustainability, only four cages (100-square-meter each) are kept per hectare with regular monitoring of bottom sediment to ensure no harmful residue builds up. Today, PCMP has been identified as one of the most developed mariculture parks in the country. It has a total potential area of 1,075 hectares with at the moment, 60 hectares allocated for marine fish cage and 20 hectares for seaweed production. As a result, PCMP has contributed food security to the city with some 8,400 metric tons of fisheries with a value of PHP 830 million (US$15 million), and has provided over 500 jobs to the community. And with aquaculture predicted to provide up to 20% of all human protein requirements by 2050, along with White Shrimp having effectively become the most sustainable and efficiently grown protein source grown on the planet, aquaculture looks set for a boom period. As long as the sea-farmers take care of the sea.